My father S.K.Pati worked at the I.I.T Madras for over three decades as a Civil Engineer. When he retired he held the post of Assistant Executive Engineer. I always thought he wanted me to become an Engineer as well but somehow the engineering "gene" seemed to be passed on only to my younger brother who went on to become an Industrial and Production Engineer. However it was little sister that actually inherited Acchan's engineering skills when it came to building homes. 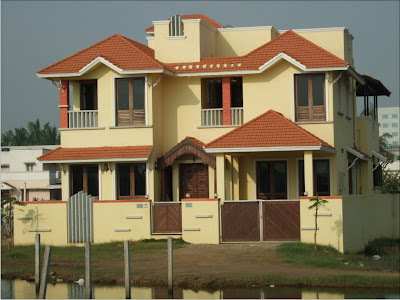 Purely self-taught Suji has modified one home and contructed another three homes almost all by herself including one in Toronto, Canada. I write "almost" because the one in Toronto was built based on an original plan by the builder but it was fully customized by her. Unfortunately she had to sell it even before occupying it. It sold in record time and to the vert first buyer who came to see it. The second was our parents' home in Velachery and the third her own home in Thoraipakkam, Chennai. And because she hasn't studied architecture she gets the architect to make the drawings of the structure after planning it and doing the basic drawing herself (which I guess she will be doing it herself in the future). The rest of the entire construction, every inch of the land, and house was on her. Everything from choice of colors, dealing with the labourers, checking out the funrnishings, decorating and beautifying, "alles" was done by her. Some of the furniture was designed by her too. As for her Thoraipakkam home she tells me that this was only a very simple plan and that she has only started furnishing the home. I wonder what her other creations will be. She also tells me that there are numerous faults in the construction though I can make out only a few. Check out pictures from the "Suji's Home" album at My Pictures on the sidebar. Though she hasn't yet thought of a career using her skill (I have been pushing her) she has been doing some free consultations for friends. If you need to contact her for consultations let me know at subashsl(at)gmail(dot)com.